Our post-Thanksgiving walk drew a great turnout of 45 people plus pets, as Friends of Herrontown Woods vice president and hydrogeologist Jon Johnson spoke about the magnetite he had discovered in boulders along the ridge. He recruited kids from the crowd as helpers, gave them strong magnets and let them search for magnetic pebbles in the stream. We learned that some rocks in the preserve date back to the dinosaurs, and that he had tracked the magnetite upstream, like a prospector for gold, back to a motherlode near Stone Hill Church. After absorbing this mind-expanding lesson in local geology, we took a brisk walk along the yellow trail, passing the area where large boulders were once quarried. Most hikers then joined us for refreshments and socializing next to the Veblen House. Follow this link for more info about the magnetism. 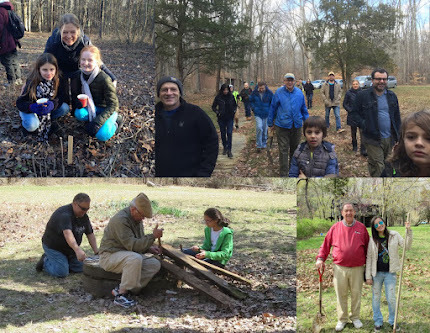 Please remember the Friends of Herrontown Woods in your holiday giving. We're grateful for your support. Click here to make a donation, large or small.